Access Your PRTG Installation with Your iPhone, iPad, or iPod touch! PRTG for iOS is an app that connects your iPhone, iPad, or iPod touch to your PRTG installation—for free! 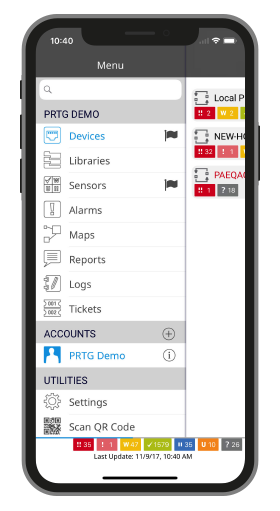 Do nearly everything you can do in the PRTG web interface: For example, acknowledge alarms, pause and resume sensors, set priorities and favorites, scan your network status instantly, work with the ticket system, and edit object comments. Access reports, send them as PDFs via email or print them with AirPrint. PRTG for iOS connects to PRTG servers using HTTPS or HTTP over VPN in mobile networks or WiFi/wireless LAN. Choose your language: PRTG for iOS is available in English, German, and Dutch. Check your network on your wrist: PRTG for iOS supports a wearable UI—the Apple Watch. PRTG for iOS provides Simple Ping to check server reachability without having to connect to a PRTG server. As PRTG for iOS connects to your PRTG server, you can see your device tree, sensor lists, sensor data, maps, libraries, logs, and many other things—in a familiar iOS way. 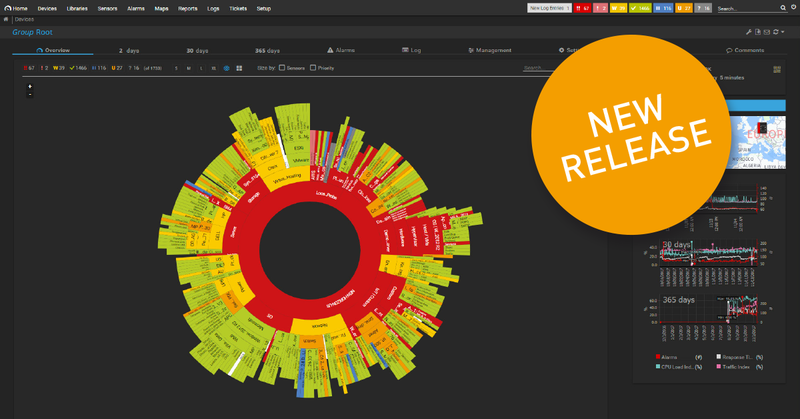 View also object comments and current logs. Refresh a page by shifting a monitoring object downward. With push notifications, PRTG can send you instant notifications to your mobile device's notification bar. 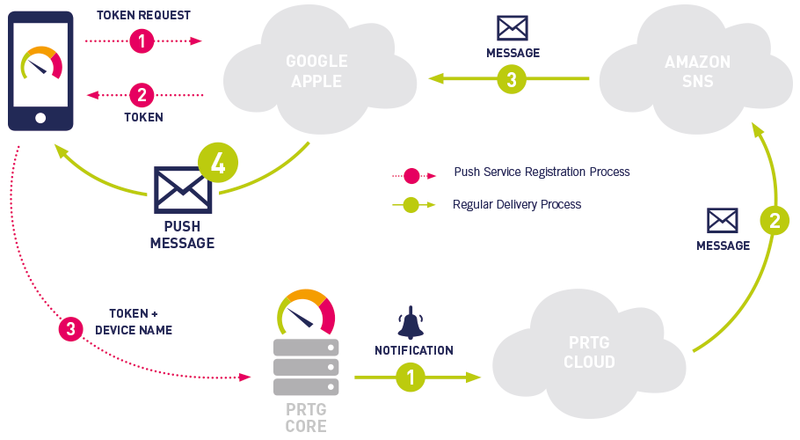 Push notifications integrate seamlessly into PRTG's notification concept and can be configured on the PRTG server. With pull notifications, you have flexible control over what triggers a notification and how often the app should check. Get widget notifications: PRTG for iOS polls your servers for a quick status check—even if the app is not explicitly started. This short tutorial shows you how easily you can manage your PRTG installation with our PRTG for iOS app. 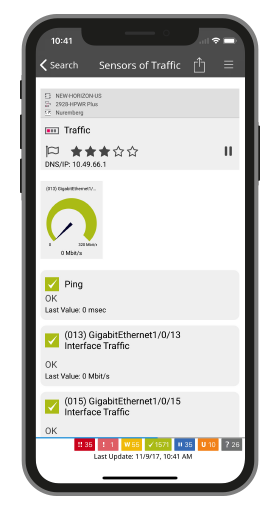 So you can even monitor your network when you're on the go with your smartphone or your smartwatch! This video is gonna carry some new features for the PRTG for iOS application from Paessler. The first thing you'll see when you open up the application is the last view that you had when you have that application open. You can click on a group and then click on a group that is underneath that group in your PRTG installation. You can keep going until you find the host or the device that you want to look at in your PRTG installation and go to a specific sensor. The sensor overview tab will give you an idea of which sensors are green or other status. 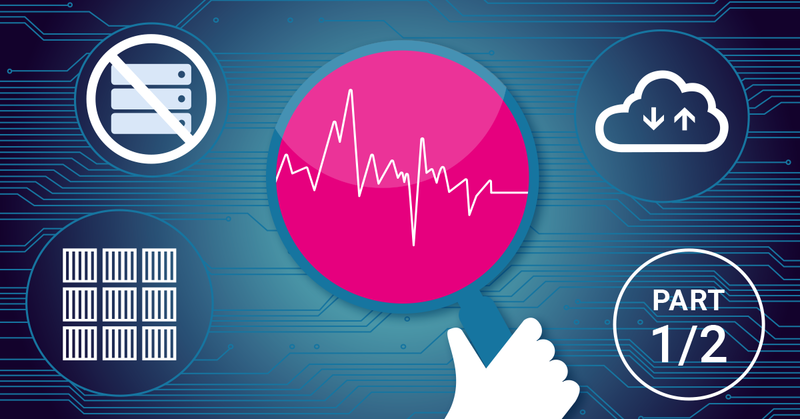 Once you click on a device you'll be able to see all the sensors for the device. There you'll be able to see the status as well of all the sensors whether they're in error status or okay status or warning status. This gives you a good overview of how the health is of the actual device in PRTG. When you're at the sensor overview page you can see the various statistics for the sensor as well as the graphs at the bottom. You can click on the graph on the bottom to actually make this also full screen. Some other features on the sensor page are the ability to favor a sensor or to change the priority of it. If your favorite a sensor in this dialog box then when you click on the installation on the selling side you'll be able to see that right away. 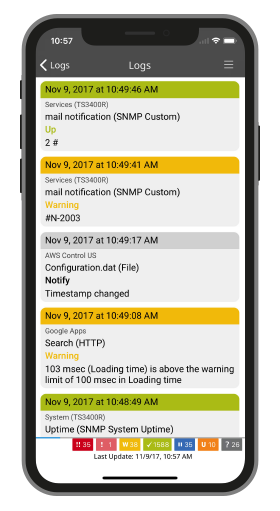 Some other new features of the app are that you can acknowledge alarms with the acknowledge in text as well as pause sensors that maybe in a false state or being worked on. Something else that can be done through the PRTG for iOS app is looking at the maps that you have in your PRTG installation. You can view at the entire map with your iOS device directly with PRTG for iOS app. Here you can see a map of our monitoring environment here at Paessler. With the PRTG for iOS app you can also view reports that you have run before. Here we can look at the top most least use bandwidth sensors click on the report and you get directly in the iOS app. If you have a newer iOS device then the new notification feature is quite handy as well. With the new app you can set background and foreground notifications for errors warnings and unusuals and PRTG for iOS will notify you even if it runs the background whenever new alarms are detected. 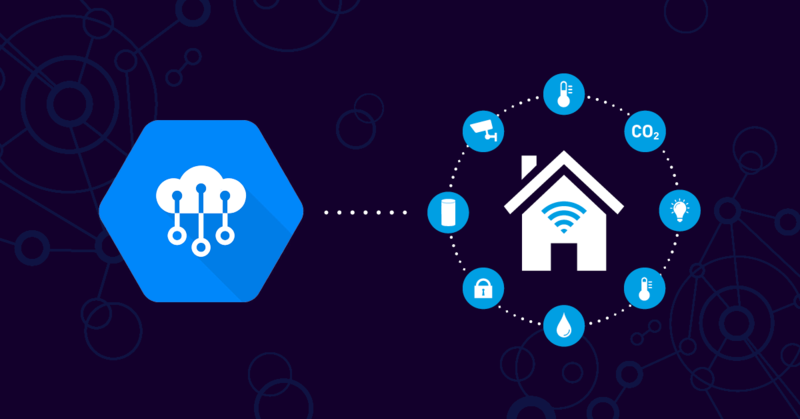 You are even able to decide which sensor types you want to have notifications for. If you have an issue with your PRTG installation itself you can also submit a support request directly to our team through the PRTG for iOS application. With PRTG for iOS you can even connect to different PRTG severs at the same time to keep track of multiple instances of PRTG. We think that all over Apple mobile device users are going to love this new app and hope that it along with your awesome PRTG software will keep your network running smoothly without any of those a.m. "hey the network crashed" phone calls. We hope that you enjoy the PRTG for iOS that we've built for you and hope that helps you on your network more effectively and seamlessly. iOS version: You need iOS 9 or later to install the latest version of the app. Hardware: We regularly test our PRTG for iOS app on the latest iOS devices. We're confident that the app will run smoothly on any iOS device. PRTG Server: The server you connect to needs to be reachable from the network your device is connected to—either directly or via a VPN connection. The server requires PRTG version 13 or later. If you want to configure push notifications, your PRTG server must run version 14.4.13 or later. 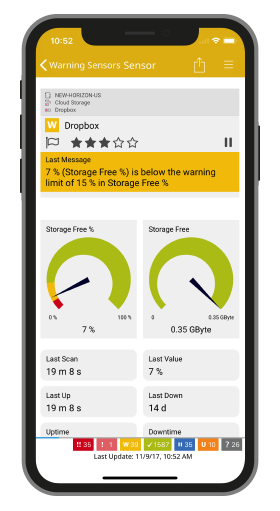 Note: The app currently does not support PRTG cluster setups! Should you require more detailed information or further assistance, please contact [email protected].